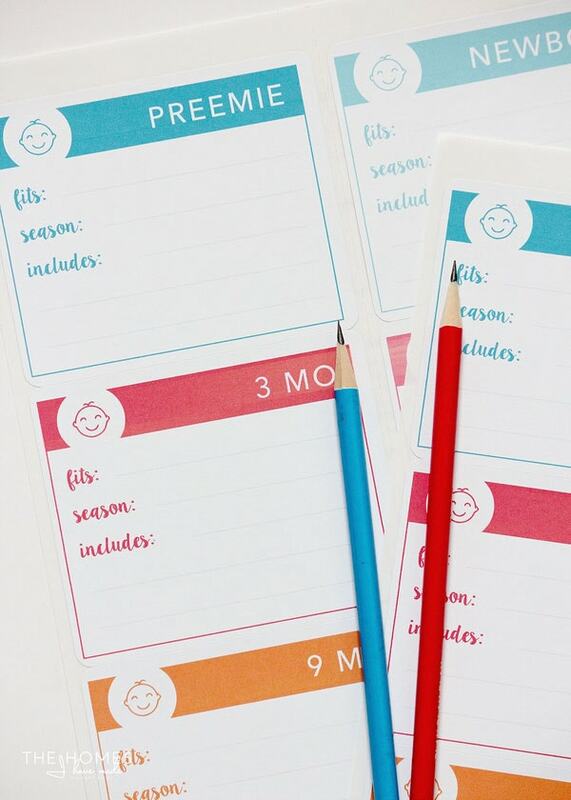 We’re rounding the corner on our final few sets of printables, and I am super excited about the last three kits I have in store for you guys. This week’s printable set is one I have been meaning and wanting to make for a while, and just never found the time to sit down and do it. Thanks to this series, I finally carved out the time, and (hopefully!) 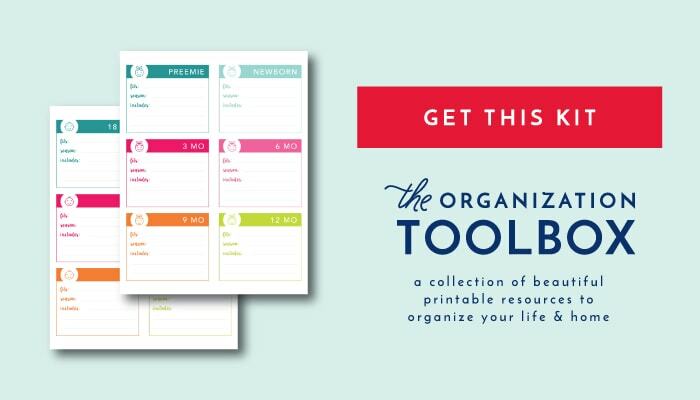 many of you will find them useful! 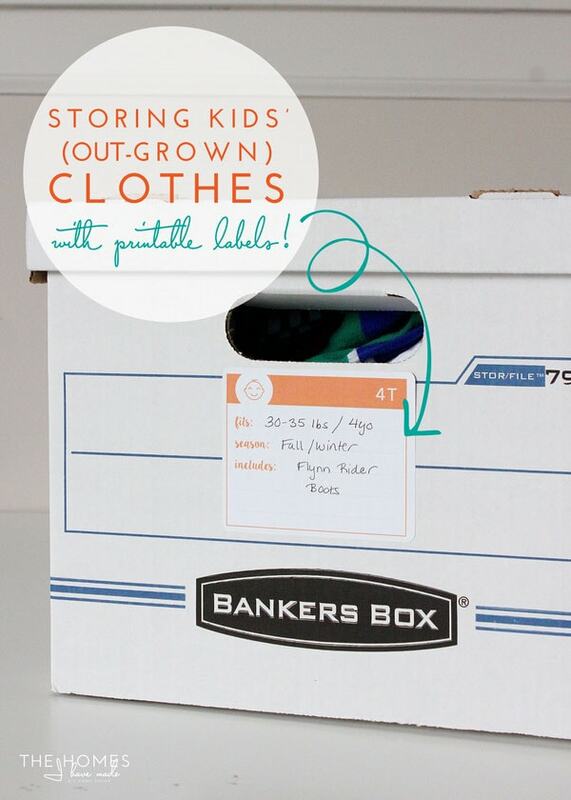 Today, I’m sharing how we deal with storing kids’ out-grown clothes, and I’m sharing some printable labels that will make keeping old clothes organized, sorted and labeled fun and easy! As unpredictable as kids are, the one thing that is certain is they will grow! 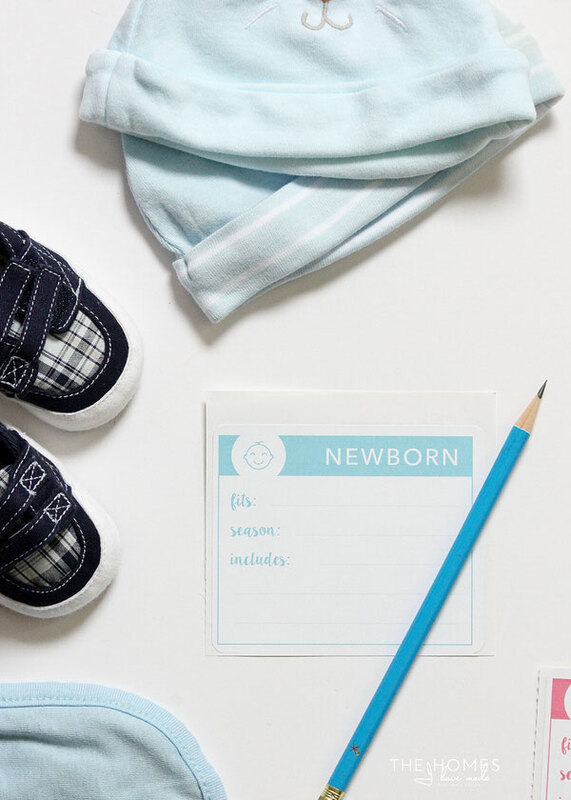 Even just a few short weeks after they are born, you start to accumulate clothes that no longer fit and are faced with the conundrum of what to do with them all. For many families, it makes sense to keep out-grown clothes in case you need them again. 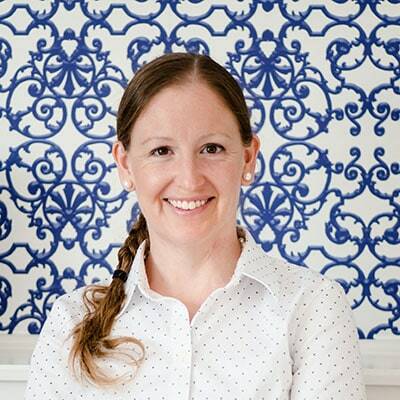 But in just a few short years, you can end up with clothes in dozens of sizes across several different seasons, cluttering up drawers and closets, if you don’t come up with an efficient and space-savvy way to store them all. We only have one child and are certainly no experts, but we’ve found a system that’s working pretty well so far! It didn’t take me long into motherhood to grow weary of Henry’s out-grown clothes cluttering up his nursery drawers. Even after I identified a way to keep all the clothes sorted and organized for deeper storage (more on that in a sec), I still found myself with a pile…somewhere in his room…of things that no longer fit. I was very good about taking too-small clothes out of his drawers, but I would be too lazy to go to the attic/garage to put them away for good. Since moving into this house, I finally found a solution that is working pretty well. 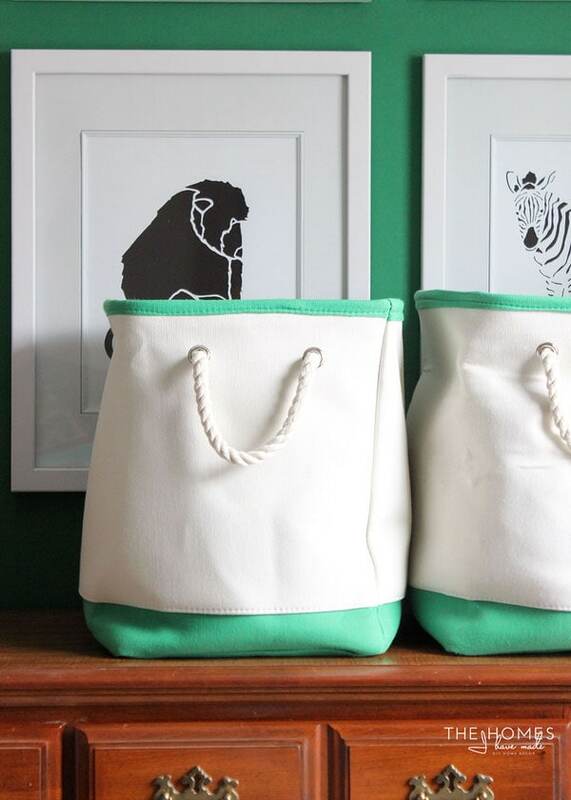 I have put two canvas totes onto the upper shelf of Henry’s closet. One tote is for toys/books that are too young for him, and the other is to hold clothes that he has out-grown. If/when the bin gets too full or we have moved onto the next full clothing size, I then go through the clothes, decide what to keep/donate, and then transfer the “keepers” to long-term storage. Just a note! I’ve found having baskets that Henry can’t see through work better for transitioning things out of his room. He gets pretty attached to things, even his clothes, and wants to wear some of his favorites long after they fit well. When something has really become too small, the canvas bins help conceal it so he eventually forgets about it. As I said before, when the canvas totes become full or we move on to the full next size, I move the clothes into our attic/garage storage. 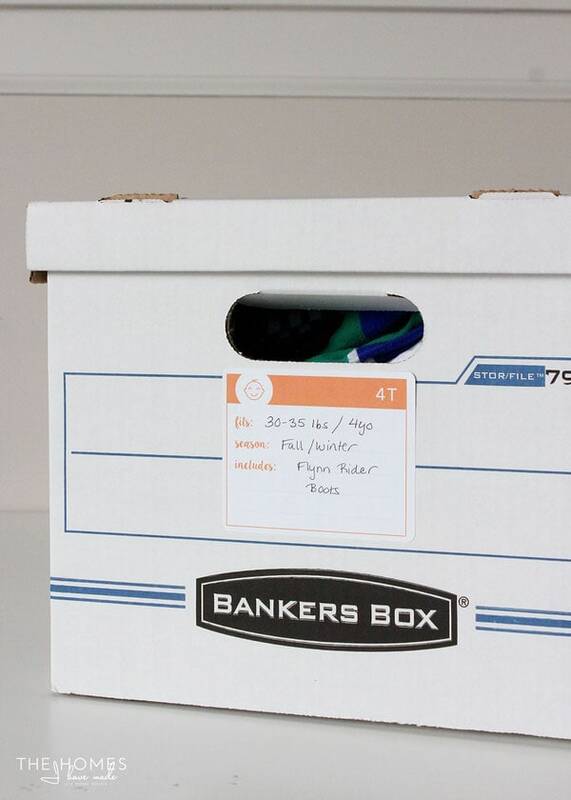 After experimenting with a bunch of different bin/box options, I ultimately landed on cardboard bankers boxes . They are cheap, the perfect size for kids clothing, stack well, and survive moves in decent shape. We started in smaller tupperwares, but after so many cracked bins after moves, I’d much rather use cheaper cardboard until they fall apart! I limit the amount we keep to one box per size (so we have one newborn box, one 3 mo box, one 6 mo box, etc). This has been fine so far (he’s only in 5T clothes), but I may have to adjust my box size/quantity as his clothes get bigger. I used to just write the sizes on the side of the box and call it a day…now I have pretty new labels to help me detail the contents of each box, and I can’t wait to show you guys! 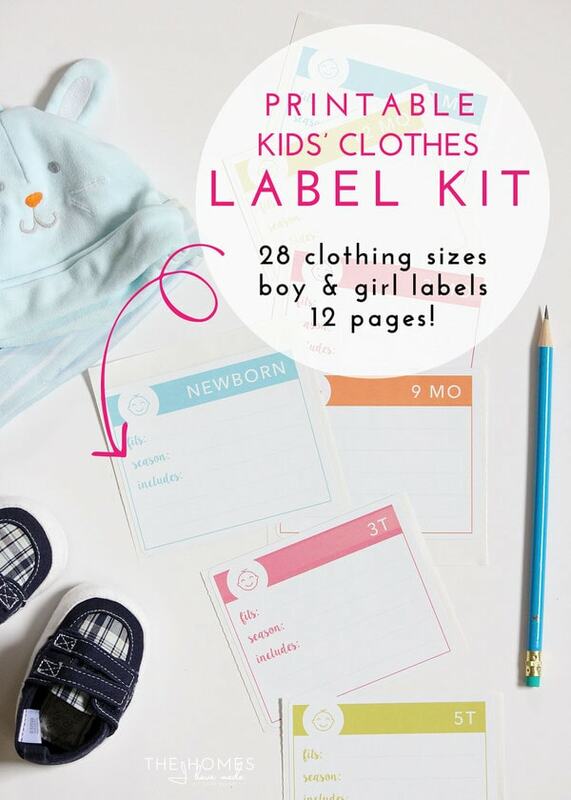 This kit includes 6 pages of labels for each gender. 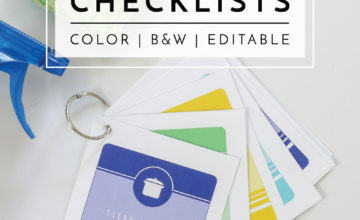 Five of the pages include 28 different pre-populated sizes; and the final sheet is blank to write in whatever you want! Here are the sizes and colors represented in this printable kit! 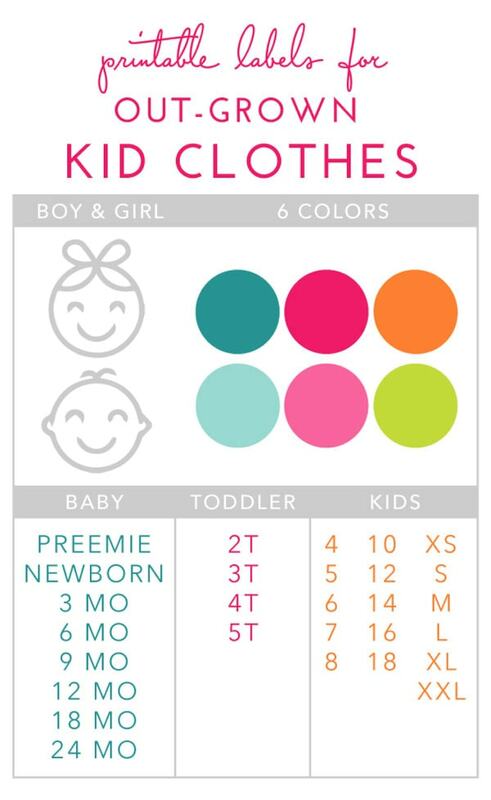 Printing and Using the Kids’ Clothing Labels! I wish I had these labels when Henry was first born so I could have started this solid organization/labeling practice early! Nonetheless, I’m excited to have them now, and it should be relatively easy to re-visit our boxes and label them appropriately! #Right?!? 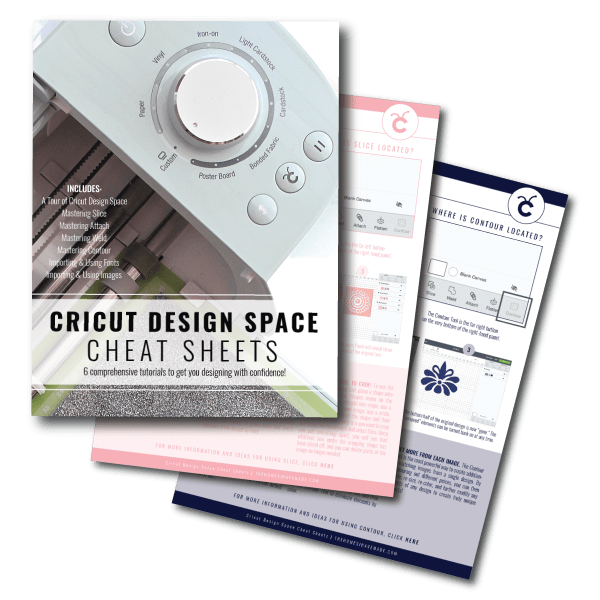 After you download the file, I recommend printing just the sheets/sizes you need for your current storage situation and maybe one or two sizes up. 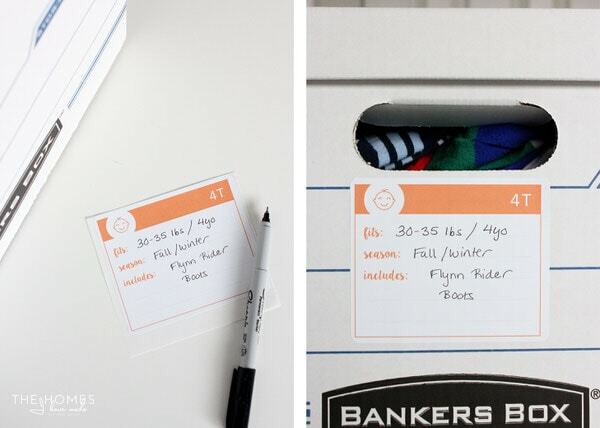 The labels were designed to fit onto Avery 5264 labels, so all you have to do is literally print, fill them out, and attach them to your bins/boxes of clothes! 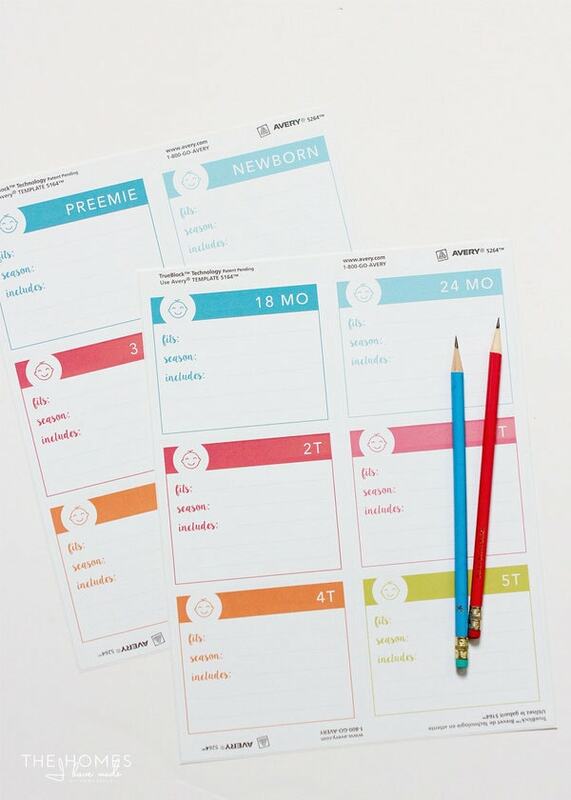 If you don’t want to order special labels, you can easily print these onto paper or heavy cardstock, trim them down, and then attach to your boxes with clear tape or contact paper. 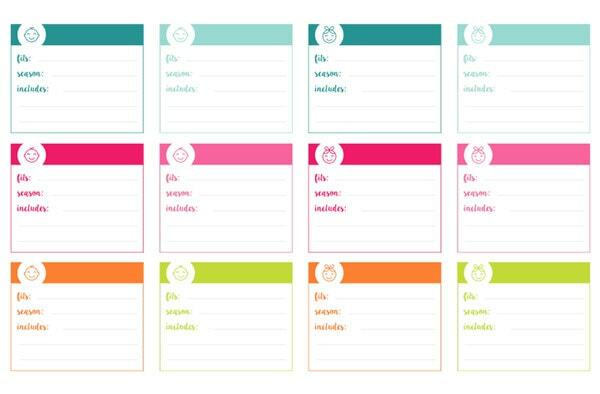 As I mentioned before, each label already has a gender and a size in the header box, but I left blanks for you to fill in notes that are useful to you. I found that Henry’s clothes often fit a little off from the “recommended” sizes, so adding in pounds/ages was helpful to me. The season of clothes and any specialty items (that you might go looking for) can also be included for easy reference! 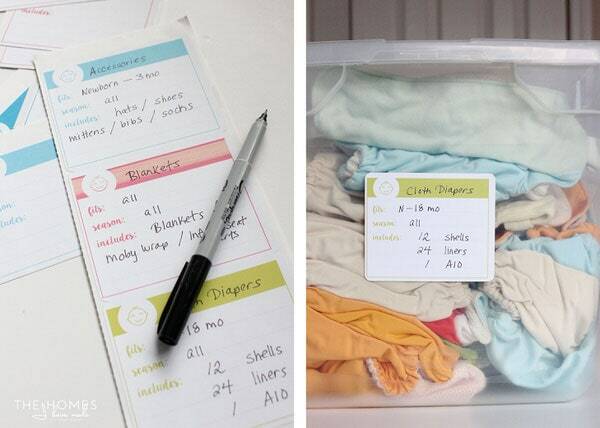 I also included a sheet of labels with no sizes on them so you can fill them out and use them for whatever child items you are storing! 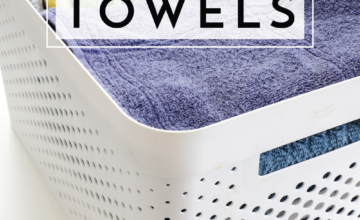 These came in handy for our boxes of cloth diapers, blankets, hats/shoes, and anything else that wasn’t size specific. 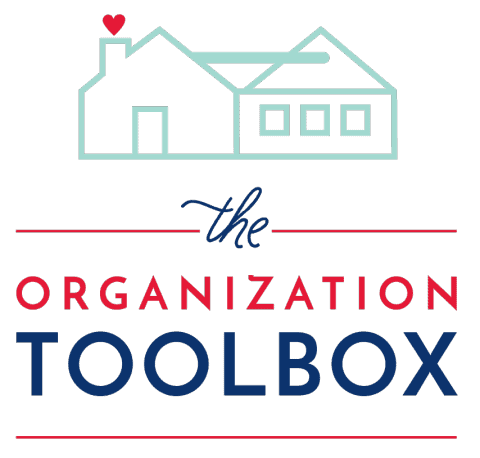 These Kids’ Clothing Labels have been uploaded to The Organization Toolbox and are available for download right now! 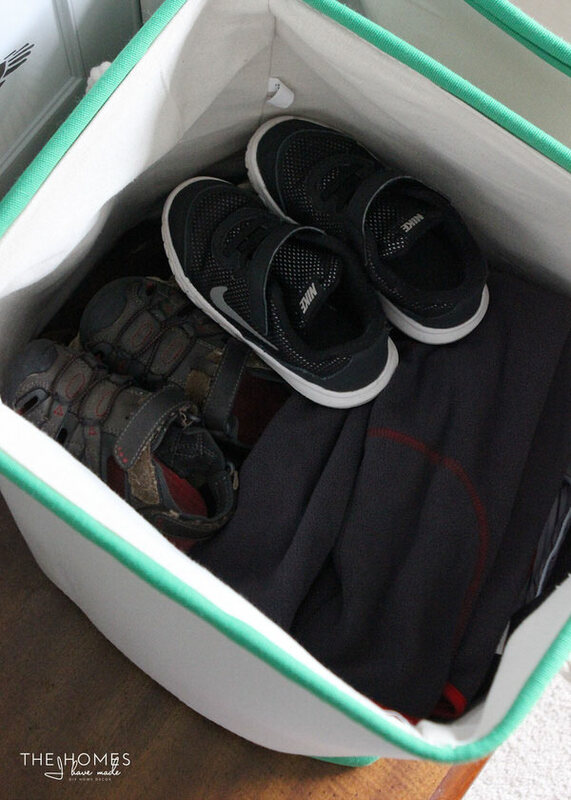 With only one child and clothes up to 4T-5T, I am clearly not an expert in the best ways to store and organize tons of out-grown clothes! 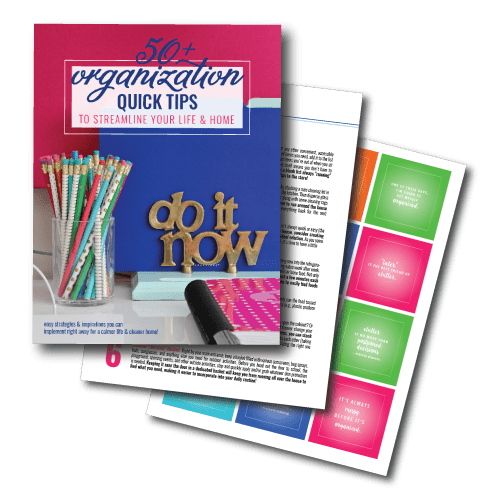 If you have some great tips or suggestions, please leave them in the comments below! 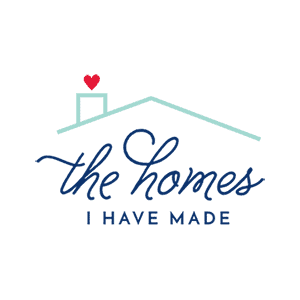 I always love hearing what works for other families and households! 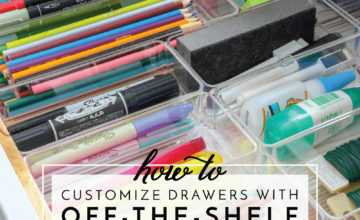 My fourth and final dresser makeover didn’t go as smoothly as I hoped (which is why it didn’t hit the blog last week). I think I’ve worked out all the kinks, so I should have it up here for you on Thursday! See you then!